This article explains how Varnish is implemented in this server to speed up the site. Using Apache to do SSL offloading – https (port 443) hits Apache then it forwards traffic to Varnish. User requests are either http:// (port 80) or https:// (port 443). http:// goes directly to Varnish, that is the ideal, although in this site http:// just redirects you to https://. https:// goes to Apache which acts as an SSL offloader and the backend for the site at the same time. 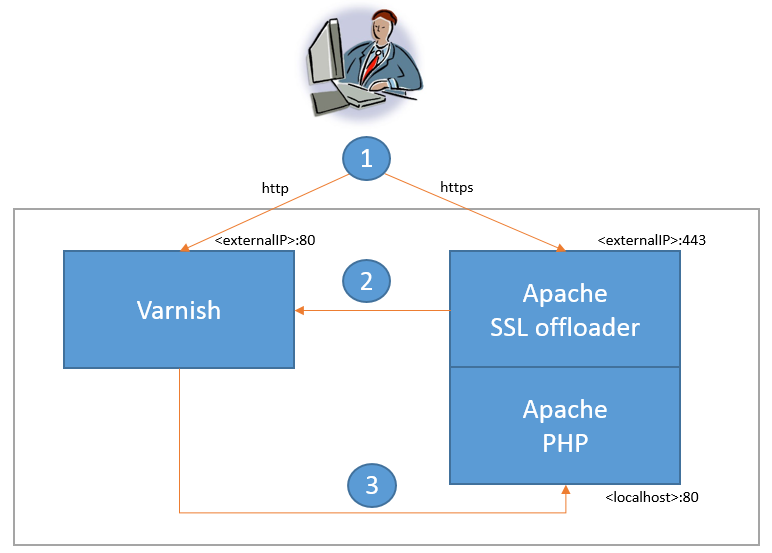 Apache forwards the requests to Varnish in http:// (Varnish doesn’t support SSL) who will cache the responses. A header is added by Apache so Varnish knows the http:// request is originally https://. Same Apache server will them receive the http:// misses from Varnish, it will be a different virtual host listening in 127.0.0.1 port 80. Better is to install Varnish from repository, so you can keep it up to date with the rest of the OS. Best it is to use Chef: https://supermarket.chef.io/cookbooks/varnish or any other configuration management tool. Once installed Varnish it should listen on ports *:6081 and localhost:6082 by default and use in-memory cache as storage backend. To force Varnish to listen in a particular IP (not all) we use the -a paramenter (we can use it multiple times as shown in the example with both the IPv4 and the IPv6 addresses). I have also specified a custom .vcl file with -f parameter, there is where all the magic happens. In Ubuntu this config would be in “/etc/default/varnish” and the file will have a different format but it is very similar, keep in mind you just want to change the listening IP and port plus the path to your new .vcl file. The backend (or backends), this is where Varnish sends the traffic for things it has not in the cache (misses). How to cache (if different from its defaults). Without changing anything Varnish will try to grab the requests to cache from localhost port 8080, which in our case we need to change to port 80. Any request with a Cookie header will NOT be cached by default. Any request with any Auth header will NOT be cached by default, (logged in users). The power of Varnish relies on the fact that you can customize every stage of the process where Varnish decides what to cache and how to cache. Varnish by default will not give you a cached result if your request has a Cookie, as this means you might be authenticated and accessing private content, it will not cache responses that have the Set-Cookie. Problem is WordPress, Google Analytics will set a Cookie header for your site, stopping Varnish from being able to cache anything really. Avoid Varnish from trying to cache big files. Caching big files has not speed benefit as these are limited by bandwidth and they just use the cache memory. My site is https only and is more efficient to redirect directly from Varnish. # Removing Cookie from static requests regardless of query string. # Removing Set-Cookie from static responses regardless of query string. Force everything to be cached. Remove the “Vary: User-Agent” from responses. If you add some code in your custom .vcl, for example under “vcl_backend_response”, Varnish runs your code and then it continues running the default code for that function. If you don’t want that just add some “return()”, this is how you change state in the Varnish workflow, for example from state “vcl_recv” you can change to state “vcl_pass” with “return(pass)”. A request that has been served by Varnish will have extra headers. If Age = 0 it means it was a response that was requested to the backend (miss). if Age > 0 it means it is a cached version and the number is the age of the content in seconds (hit). You can have multiple backends and use it to distribute traffic (load balancer). Use varnishlog in the server to see in detail (all headers) how a request is received, delivered or fetched from the backend. Use varnishtop to see most common occurrences. Use varnishadm to change some configs or perform administration tasks. sudo varnishadm "ban req.url ~ /wp-content/. *"
Varmish is an HTTP accelerator. Basic function is to cache responses which are grabbed automatically from the backend. It delivers content from its cache faster than anything, including Nginx, and makes your website significantly faster reducing the load on the process, it just needs RAM to store the cache. Unless you do complicated coding within the VCL it uses very little CPU. You will run out of bandwidth faster than CPU and the RAM it needs is limited to your configuration. With JMeter I got a server delivering 5000 requests per second, using the full 1gbps link, while using 25% of its CPU (4 cores CPU). Thank-you for your excellent writeup. These are the only instructions I have been able to find which don’t tell me to run a second webserver when running HTTPS. Thanks!